Last post, I mentioned that I would be using British Airways Avios points to get to Philadelphia to begin my trip. In looking over my notes, I got confused with a more recent trip I took to Costa Rica (for which I used Avios). I updated the other post, but wanted to clarify that I ended up taking a US Airways flight to Philadelphia (since it was so cheap, $69 one-way). The correction is actually a nice segue into the subject of this post: how did I get to China? Writing about it is going to make me pretty bitter, honestly. Why? When I took the trip, I had the coveted Executive Platinum status with American Airlines, entitling me to all sorts of entitlements with which I had a tremendously entitled sense of entitledment…you get the idea. Life is good flying as an Executive Platinum. March 1 was a tough day for me this year. Not for any actual reason, but March 1 is The Great Status Reset Day. Logging into my American Airlines account was far less cool on March 1. Flying isn’t quite as fun as a Gold, but it’s ok. I have plans and designs for earning back my EXP status as quickly as possible, for reasons I detailed in this post. I’ll detail my strategy once this report is done. Anyways, I made my way to DFW Airport to catch my US Airways flight. American and US Airways have had a fairly good integration so far, with somewhat-reciprocal status benefits for their elite members. My flight was leaving out of Terminal E, but I couldn’t go to DFW and not visit the Centurion Lounge, so I made my way over to Terminal D and enjoyed a nice 15-minute shoulder and back massage. The masseuse, after starting her treatment, said “you know your back is basically one big giant knot, right? You need to go visit someone who can break through all that, we can only go so deep here.” Noted. I hopped onto the inter-terminal train and went to Terminal E. The US Airways flight was taking off from the satellite terminal, so I walked down the long tunnel underneath the tarmac to meet my flight. I wanted to change my seat to a window seat and was talking to the gate agent about it, when I casually mentioned that I hoped everything was going well with them so far, merger-wise. She abruptly responded, “Of course it is, OUR people are running the show now.” Oooooookay then. The flight to Philly was largely uneventful. It was aboard a 737 that was built just after the Wright Brothers’s flight in 1908, I’m still amazed it stayed in one piece the entire way. Hopefully the new airline will be able to get rid of these older planes quickly. Anyway, I arrived uneventfully at PHL and proceeded to catch my shuttle to the Microtel Inn & Suites near the airport. If you’re ever been to PHL, you know the general area that has all of the airport hotels and that one Ruby Tuesday’s restaurant that limits your options for dining. It was actually pretty late by that point, so I skipped dinner and made my way to my room. It was $79 and was exactly what you’d expect from a cheap last minute room at a hotel that has “micro” in the name of it. Small, spartan, but seemed clean enough. I got a decent nap (probably 4 hours of sleep) then awoke to begin my trip. This section will serve as a friendly reminder to everyone to know your stuff and bring paperwork when necessary. I got to Philadelphia really early (4:15am, right as the desks were opening) because I wanted to leave as much time as possible for my check-in. As a reminder, I was using the Chinese TWOV (transit without official visa) program to avoid the $170 visa to China. In order to take advantage of this program, you have to enter Beijing, Shanghai, or Guangzhou from one country and leave for another within 72 hours (and you must stay in the city as well, no traveling around China). Since my flights were scheduled USA-Beijing-Japan, I qualified. Chicago agents know this pretty well, but the PHL agents had never heard of it (which is understandable, it’s a relatively new program). They clickety-clackitied on their keyboards and called a supervisor, etc. What they were doing was searching what’s called the TIMATIC database for visa rules. It’s very important to tell them to try entering you as a transit passenger with your destination as the third country. If they input China as the destination, the TWOV program wouldn’t come up. If they entered me as a transit, it would’ve. Fortunately, I had a printout from the Chinese Embassy’s website that detailed the program, and after about 40 minutes of standing at the desk (smiling and being incredibly polite), I was given the coveted boarding passes, along with a “why the heck are you flying to Miami and Atlanta on your way to Chicago?” comment. Be nice to the check-in agents folks, they’re typically doing the best they can. I was surprised that I even got TSA Pre-Check and made it through the security queue fairly quickly (it was busy that morning) and waited in the departure lounge for my first flight. Due to my (already missing it) EXP status, I was upgraded to First Class on all of my domestic legs before the international flight to Beijing. My plan was to stay awake on all of the flights, so I brought some reading material along with me. 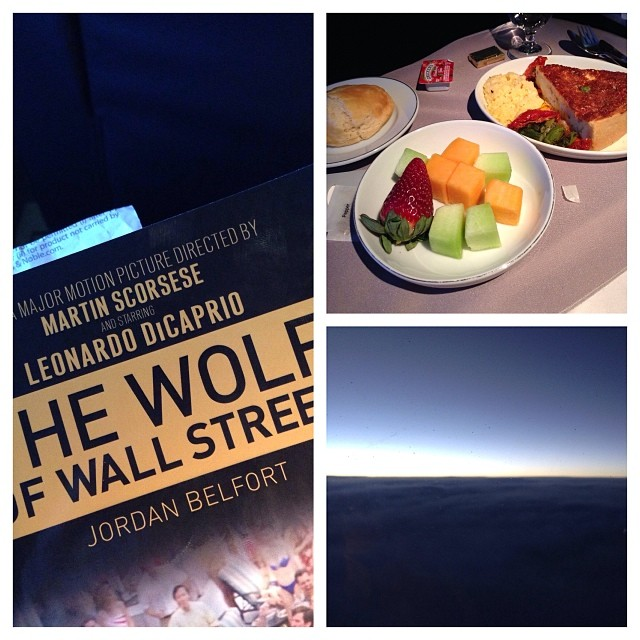 Unfortunately, I tend to read books really quickly, and actually finished the first book (Wolf of Wall Street) on the first flight. The first flight was an excellent morning flight. Good crew, full flight, decent breakfast, nothing really remarkable about it but I tend to enjoy domestic First on American and find the flight attendants usually are happy to be there and want us to be happy in front of the curtain. I arrived in Miami with about a 2 hour layover. I wandered over to the international terminal to check out the Oneworld lounge, only to find it was only open in the afternoon and evening, so I walked back to the (very nice) Admiral’s Club and…started another book. My second flight was a regional jet (ERJ 175) from MIA-ATL. It was like the first flight, very nice in an unremarkable way. Duty, by Robert Gates, had just come out and I was eager to read it. Without mentioning anything about the politics around the book, I was looking forward to it because Dr. Gates had actually handed me my diploma from Texas A&M University and I had immense respect for the man. I didn’t finish the book until recently (it’s quite a tome, over 600 pages), but found it to be incredibly fair, apolitical, and informative. I’m a bit disenchanted with the political process in America, so it was good to hear of both Democrats and Republicans that love their country very much and are doing the best they can. I tried to catch an earlier flight from Atlanta to Chicago but was unable to. My flight to Chicago already had a really short connection and our flight was further delayed, making it a REALLY tight connection. I was too distracted and nervous to take any pictures of this flight, but managed to stay awake for the journey. I landed at Chicago and pretty much Home Aloned it over to the gate for Beijing, hoping I’d be there in enough time. The gate and plane were still there when I arrived, panting, at the desk. The gate agent looked at me a little funny and let me know they were just about to start boarding First Class. I had made it! I didn’t have time to stop by the Flagship Lounge, but no matter, I was about to fly in Business Class to Beijing! For those of you who don’t recall, since it’s been a bit since my planning post, I booked this trip when American had left a zero off the fuel surcharges, equating to a $440 roundtrip from Philadelphia. I was able to use a Systemwide Upgrade (one of the best benefits in the sky) to upgrade even this cheap fare to Business Class for the long flight from Chicago to Beijing. For free. That’s why Executive Platinum status is worth it. I boarded with the First Class passengers (a benefit of status) and made my way to my seat. 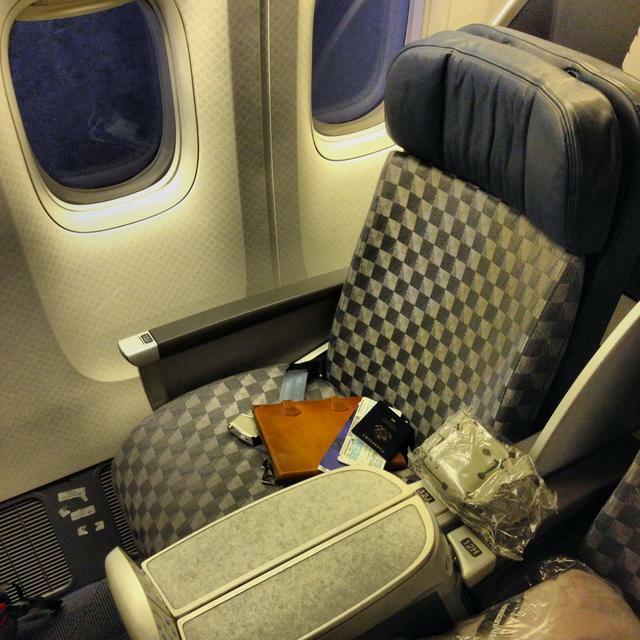 It was American’s older Business Class longhaul seat, which will slowly be replaced with a newer seat (already available on their 777-300ER aircraft and reviewed by Lucky here). Sure it was the old seat, but then I got some great news: the load in Business was very light that evening, and no one would be sitting next to me. Score! I had previously flown First Class and Coach on the 777-200, so it was good to finally enjoy Business Class. The seat was nice enough, had easy to use controls on the armrest, and reclined to a nearly-flat bed. You can see American’s new amenity kit between the seats, which contained the normal bits for a longhaul Business flight. We boarded rather quickly (overall there was a really light load, not just in Business) and before I knew it one of the flight attendants came by and welcomed me to the flight. She was absolutely delightful the entire flight and chatted with me about where I’d be going in China, laughed at my mileage running, told me I pretty much had the run of the place on the flight since it was so empty and promised it’d be the best flight I’ve ever taken to Beijing that evening. She had such an easygoing yet professional attitude that she made it a truly memorable flight. After we leveled off, a round of drinks came by, followed by the dinner service. The tuna was excellent, very impressive for an appetizer in Business. Then came the Steak course. The steak was very overcooked, but I pretty much expected that going in. The sweet potatoes were excellent, and I finished about half of the steak, saving room for The Sundae. Ice cream, strawberries, caramel, whipped cream, nuts, you name it. It was delicious. I popped a few melatonin pills, laid my seat all the way back, did some weird contortioning until I found the right position (it’s hard being in an almost lie-flat seat when you’re a stomach sleeper) and had one of the best sleeps of my life on a plane. I slept for a good 7 hours and woke up with about 3 hours remaining. The flight attendant came by and offered me some coffee while I watched some Anthony Bourdain episodes on the IFE system. 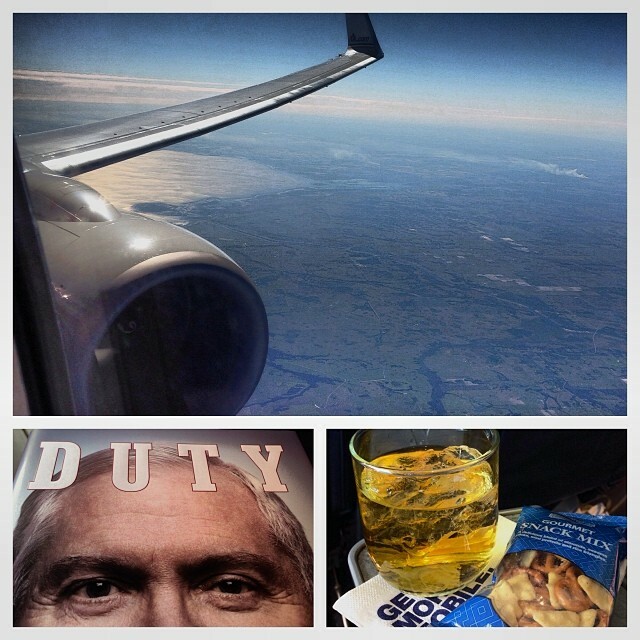 Eventually, the flight attendant came by with my bre…sorry, second dinner. Due to the international date line, the flight left from Chicago at 6:10pm on Thursday and arrived in Beijing at 9:45pm on Friday. So, instead of breakfast, they offered a hybrid breakfast/dinner. By that time I was still full from the dinner, so I nibbled on it for a bit and then got ready for landing. We touched down on time at PEK. I was nervous about the TWOV, but I showed my documentation to the immigration officer and was on my way after no more than 5 minutes. Way faster than it usually takes me to get back into my home country. Not bad, China. I love Flyertalk. It’s one of the best travel forums in the world, and there are recommendations for just about everything you could imagine. So when I asked the China Board about a good driver, they recommended Simon to me (I didn’t want to mess with the language barrier arriving so late). I’ll share more about Simon later, but he offered a great service at a very fair price, so I hired him to drive me from the airport to the hotel and on a tour the next day. As I left the immigration area, I saw a sign with my name on it and a smiling young man from Beijing named Simon. He could not have been nicer, welcomed me to his country, insisted on taking my bag, and we made towards the parking garage and his waiting Toyota. As we made our way into the crazy Beijing traffic, he pulled out a local cell phone and gave it to me with instructions on how to call him if I needed anything during my stay. He drove me directly to my hotel, the Red Wall Garden Hotel, which came highly recommended on TripAdvisor, for great reason. As I made my way toward the check-in desk, Simon said he would pick me up at 8:30 the next morning for a wonderful day I’ll never forget: the Great Wall of China.